The writer was privileged to meet his school days’ idol G.S.B. Rani Perera in London, an icon in the Sinhala Radio at the age of 74 on her final stages of life and during her maiden trip to the UK. Her very first words before we sat down to discuss her life and career, keeps on resonating in my ears to date. She said, “Son, if you believe in Buddhism, you will never go wrong in life.” It came as such a jolt that within a week of our meeting in London, she had to bid adios to the world. What remains today is only her golden voice on magnetic tapes and CDs, thanks to advanced technology. Gnai Sinari Benzajaya, born on 20 August 1930 came to know about the musical industry at the age of 14. She was rapt by music when she accompanied her cousin to Colombia Recording Studios as a chaperone. Providence always performs miracles in the most startling manner quite unpredictably, which exactly was the case with G.S.B. While she was inside the Colombia studios, the Manager of Colombia Recording Studios approached her like a bolt from the blue and requested her to cut two records. The next biggest impediment was to convince her father who intensely objected to the idea of girls getting involved in professional singing. With much coaxing by the management of Colombia Studios, finally her father agreed to their request but not under her original name. She, therefore, had to use a pseudonym using her initials “G.S.B.” and adding Rani at the end. Finally GSB Rani’s first two records came out under the titles of Samagi Bale Paami and a duet with Mohideen Baig, Siri Sara Bhavane. With the release of the two new records her popularity was on the rise. Soon she was awarded the ‘A’ grade status for singers by the Ceylon Broadcasting Corporation. Susil Munasinghe the Chairman of the Ceylon Broadcasting Corporation during 1970 to 1977 designated G.S.B. Rani as one of the Sinhala music programmers. This was an era when the Ceylon Broadcasting Corporation went down in history for courageously taking the decision to face out Hindi and Tamil songs and to espouse Sinhala music that blended with Sri Lankan culture and traditions. To accomplish the arduous task, Chairman Munasinghe entrusted all the responsibility upon G.S.B.’s shoulders as a Sinhala music programmer. She in turn, faced up to the challenge by promoting a new batch of up and coming budding singers at the time, who were equally enthusiastic and agreeable to fulfil her aspirations. During her experiment and enthusiastic operation to alienate the Hindi flavour in music, G.S.B. Rani managed to record over 7,000 songs out of a completely new batch of singers by personally selecting Nanda Malini, Edward Jayakody, Victor Ratnayake, T.M. Jayaratne, Priya Sooriyasena, the late Malini Bulathsinhala and Abeywardena Balasuriya who seemingly emerged as household names. Subsequently, her intervention and relentless efforts, amidst a lot of bureaucratic stone walls, managed to persuade the Director General of the CBC to install a young Buddhist monk in the mornings for a new programme under the name of Dhamma Chintha. Her choice for the programme was a young Buddhist monk, just after the higher ordination (Upasampada status) named Ariya Dhamma Thero. The Thero became an effective preacher and an authority on performing Bodhi Pujas as ‘Panadure Ariyadhamma Thero.’ Since the morning Dhamma Chintha programme became extremely popular G.S.B. Rani was able to convince the Radio Ceylon hierarchy to allocate a permanent slot for Radio Bana (Buddhist discourse) for the first time in the history of the radio in Sri Lanka. This has today spread into TV channels, including separate Buddhist channels. Panadure Ariya Dhamma Thero respected and thanked G.S.B. Rani and treated her like his own mother, and never failed to address her calling Amme (mom).While she was in London if one were to address G.S.B Rani as Amme, she said immediately that took her mind back to the memory of Panadure Ariyadhamma Thero. Although Gnai Sinari Benzajaya was born to a Malay family after her marriage to a Sinhala Catholic Anton Perera, she converted herself to a Buddhist and also managed to convince her husband and her three children too to become Buddhists. Influenced by her brother-in-law and politician, R. S. Perera, she dabbled in politics for 45 years of her life unaffected, but only with her strong convictions and political ideology. She was a staunch Sri Lanka Freedom Party (SLFP) supporter, and was appointed as an all-island organiser of the women’s wing of the party. 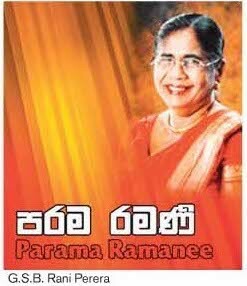 In 1967 she contested the Colombo Municipality elections to represent Milagiriya ward on the SLFP ticket and lost by 448 votes. A negative factor, regrettably, prevalent in the Sri Lankan society is jealousy. When a person does an honest job, colleagues around him begin to give the knife from behind rather than a helping hand from front, due to the poisonous serpent coiled round within some human beings. This was exactly what G.S.B. Rani had to endure when malicious, abusive poison letters to the management went to bring about a complete devastation to her career. Finally she became a political target and a victim and had to pay a heavy price for it, which cost her lucrative career at the Radio Ceylon and declared her as persona non grata even to the Radio Ceylon site for 15 long years, apart from taking part in any of the Radio programmes. This was the tribute she received in transforming the affairs and programmes at the Radio Ceylon during her service towards a betterment and to bring about a national flavour. However, in 1994, President Chandrika Kumaratunga, under her People’s Alliance regime, issued special instructions to reinstate G.S.B. Rani and appointed her as a Director of the Independent Television Network (ITN), where she held that position until 2001. Having been trodden under a heavy political boot and raising her head once again after 15 long years with courage, she amplified the fact how she bounced back once again from the BMICH in February 2004, and her second journey in her professional path had just begun from London, at the age of 74. When she spoke those emotional words she was determined to catch up with the lost years in her musical career, but unfortunately providence served her with a sledgehammer blow quite unexpectedly in September, letting down her wider circle of fans, when she had to answer the final call from above. GREAT ARTICLE TILAK. I REMEMBER HER AS A STUDENT. Thank you Tilak for the great writing about a great woman. These are the true Vihara Maha Devis. I beleive vice versa of the quote by GSB is also true. take the believers down the wrong road. thrive in a society which has caste system and practising animal sacrifice etc. If you are an honest human being you have to admit those religions are religions of conveniences. Followers of them are going down the wrong road believing they are doing the right thing. I’m so taken aback by her life story & what she did at the RC & how Ven Ariya Dhamma Thero emerged, never knew. What more, but agree to her true words ”“Son, if you believe in Buddhism, you will never go wrong in life.”! May her Samsara be short lived!